Fiddler’s Green Ampitheatre is accessible via light rail (10 minute walk from Arapahoe at Village Center Station) and is served by several bus routes (65, 66, 73, AT, ATX, T). From the station, exit west (away from I-25) and continue in either direction on S. Fiddlers Green Circle (right for the box office). Use the map above or visit www.rtd-denver.com for directions from your location. Take I-25 South to the Orchard exit, go West (right) to Greenwood Plaza Boulevard and South (left) about 1 mile to available parking around the venue. Take I-25 North to the Arapahoe Road exit, go West (left) to Greenwood Plaza Boulevard and North (right) about 1/4 mile to available parking around the venue. There is public and private parking in close proximity to the venue. CLICK HERE to purchase parking now in our Gold Parking lot, then you don't have to worry about cash or where to park when you head to the show! CLICK HERE to download a printable parking map. Accessible Parking is located in the parking lot directly in front of the box office. In addition, there are spaces along the north side of Fiddler’s Green Circle. Gold parking pass guarantees a space within Tuscany Plaza Gold Parking Garage or Peakview Tower Gold Parking Lot - space is available on a first come, first served basis in each area. The Tuscany Plaza Gold Parking Garage is located conveniently across the street from the Fiddler’s Green Amphitheatre Box Office at 6312 S. Fiddler’s Green Circle. Take I-25 to Orchard Road exit. Go West at exit. Turn left (South) on Greenwood Plaza Boulevard. Continue South on Greenwood Plaza Boulevard and take a left (East) at Fiddler’s Green Circle. You will see the Tuscany Plaza Gold Parking Garage on the left. Take I-25 to Arapahoe Road exit. Go West at exit. Turn right (North) on South Yosemite. Take a left (West) on Peakview. Take a right (Northeast) on Fiddler’s Green Circle and continue around the circle for the Tuscany Plaza Gold Parking Garage. Please Note: Tuscany Plaza Gold Level Parking Garage opens around 3:30 pm on weekdays. The Peakview Tower Gold Parking Lot is located adjacent to Fiddler’s Green Amphitheatre at 6465 S. Greenwood Plaza Boulevard. Take I-25 to Orchard Road exit. Go West at exit. Turn left (South) at Greenwood Plaza Boulevard. At the first light take a right (Southwest) onto South Syracuse Way. Proceed two blocks and turn left (East) onto Peakview Avenue. The Peakview Tower Gold Parking Lot will be on the left (North) side of the road. Take I-25 to Arapahoe Road exit. Go West at exit. Take the second right (North) on Greenwood Plaza Boulevard. Take a left (West) on East Peakview Avenue. The Peakview Tower Gold parking lot is on the right (North) side of the road. 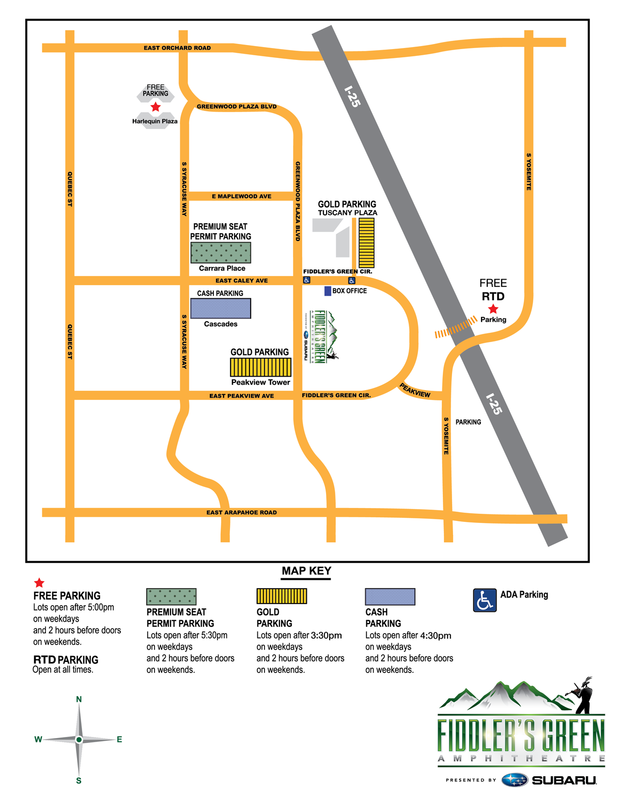 Please Note: Peakview Tower Gold Parking Lot open around 4:30pm on weekdays. The Cascades Cash Parking lot is located at 6300 South Syracuse Way at East Caley Avenue. Take I-25 to Orchard Road exit. Go West at exit. Turn left (South) on Greenwood Plaza Boulevard. At the first light take a right (Southwest) onto South Syracuse Way. Proceed down South Syracuse Way. Take a left (East) on East Caley Avenue and the Cascades Cash Parking Lot will be on the right (South). Take I-25 to Arapahoe Road exit. Go West at exit. Take a right (North) on South Syracuse Way. Cross East Peakview Avenue and the Cascades Cash Parking Lot will be on the right (East) before Caley Avenue. Please Note: Cascades Cash Parking Lots open around 4:30 PM on weekdays. The Premium Seat Permit Parking Lot is located at the Carrara Place office building just west of Fiddler’s Green Amphitheatre at 6200 South Syracuse Way. Take I-25 to the Orchard Road exit. Go West at exit. Turn left (South) onto Greenwood Plaza Boulevard. At the first light turn right (Southwest) onto South Syracuse Way and proceed approximately ¼ mile to the lot. The lot is on the left (East) side. Take I-25 to the Arapahoe Road exit. Go West at exit. Turn right (North) onto South Syracuse Way and proceed approximately ¾ mile to the lot. The lot is on the right (West) side. Please Note: The Premium Seat Permit Parking Lot opens at 5:30 PM on weekdays and two hours before doors on weekends. There is NO overnight parking. Tailgating is not permitted in the parking lots. Do NOT park on private property as your car is subject to tow. This includes the Arapahoe Marketplace parking lot.